What Do Experts Recommend for Fitness? What is physical activity & fitness? According to the Centers for Disease Control, only 60% of Americans get the recommended amount of physical fitness each day! The 2008 Physical Activity Guidelines for Americans are designed so people can easily fit physical activity into their daily plan and incorporate activities they enjoy. These guidelines recommend that you pick activities you like. Do at least two and a half hours of moderate intensity aerobic physical activity over the week, which is about half an hour each day. (Examples are walking briskly, water aerobics, ballroom dancing, and general gardening). The more you do beyond this, the higher the benefits; so an hour a day would provide more extensive health benefits. Make sure that you do at least 10 minutes of aerobic activity at a time. In fact, people who engage in short bursts of physical activity for 10 minutes at a time have been shown to be just as healthy as people who do a regular 30-minute workout every day. Check out ABE for Fitness to learn ways to incorporate bursts of physical activity naturally into your daily life. In addition, include muscle strengthening activities, such as weight training, push-ups, sit-ups, carrying heavy loads, or heavy gardening, at least two days a week. Exercise specialists, such as the American College of Sports Medicine, also recommend incorporating stretching and other exercises to increase flexibility and avoid injury, as well as exercises to improve balance and reduce risk of falls. In his Blue Zones research on people who live over 100 years, Dan Buettner set out to identify the habits and behaviors that centenarians share. One key characteristic he found was that these people set up their lives so that movement and physical activity became a regular part of their routine. Rather than joining gyms or lifting weights, they get exercise by gardening, walking, climbing stairs, and performing housework. Finding ways that make sense for you to move more often, such as taking your dog for a long morning walk or biking to work, can be an effective way of designing a routine that encourages you to exercise without thinking about it. 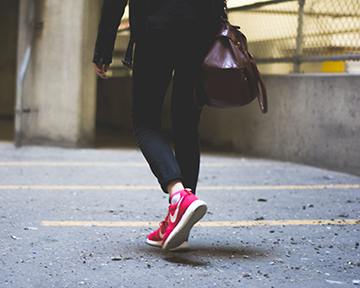 Check out these ideas to bring more walking into your life. If you maintain your walking program for a minimum of six months, you are much more likely to maintain this change long-term. Use the following ideas to start your walking program. Wear the pedometer for a few days and see how many steps you average. Set a daily goal and work (or walk) up to it. A good goal is to increase your average daily steps gradually so that you get used to the increased distance. 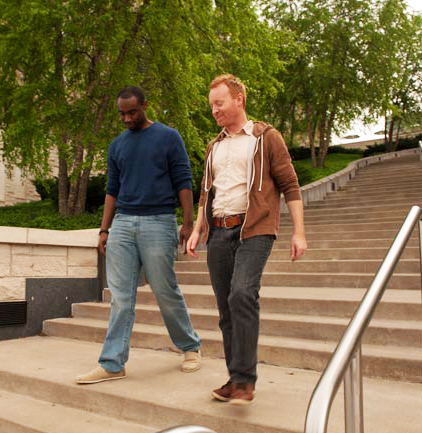 Recommendations vary on how fast to increase steps. Anywhere from 500-2,000 steps a week is reasonable. Record your daily steps in a log or notebook. What is moderate versus vigorous activity? Activity guidelines often differentiate between moderate and vigorous levels of activity, and give suggestions for each. But what is considered moderate and what vigorous? Is Your Activity Level Moderate or Vigorous? One way to determine whether your activity level is moderate or vigorous intensity is to do the talk test: Rate your ability to talk on a scale from 1-10. If you rate your level of breathlessness between a 1 and 4, you can have a somewhat regular conversation while working. You are working at a light intensity level. If you rate your level of breathlessness between 5-6, you can talk but not easily carry on a conversation. You are exercising at a moderate intensity level. If you rate your breathlessness between 7 and 10, you have difficulty talking and your word and sentences are broken. You are exercising at a vigorous intensity level. While exercise is undoubtedly beneficial, it is not true that the more exercise you do or the harder you work the body, the better the results. Too much or too arduous physical activity can lead to injury. It is essential to maintain a balance between working out the muscles without overdoing it. Know that your body gets stronger during rest and recovery. Also, be aware about specific recommendations for special conditions, such as women who are pregnant, adults with disabilities, and older adults or those with a chronic condition. Buettner, D. (2009). Blue zones: Lessons for living longer from the people who've lived the longest. Washington, D.C.: National Geographic Society. Loprinzi, P.D., Cardinal, B.J. (2013). Association between biologic outcomes and objectively measured physical activity accumulated in ≥10-minute bouts and <10-minute bouts. American Journal of Health Promotion; 27(3):143-51.